Your members and contacts may have multiple email addresses, or else share an account with someone who has a different email address. Consequently, you may want to automatically copy – aka CC – your email messages to your contacts' secondary or alternate email addresses. If you want to automatically copy emails to secondary or alternate email addresses, you need to set up one or more custom fields to store the secondary email addresses for your contacts, then you need to enable the CC emails feature. To store your contact's secondary or alternate email addresses, you need to create one or more custom text fields (unless you are already collecting this information). You can add the field(s) as common fields, if you want to store them for all contacts, or membership fields, if you want to store them for members only. To add the field to your membership fields, hover over the Members menu and select the Membership fields option. To add the field to your common fields, hover over the Contacts menu and select the Common fields option. Click Add new field button. Leave the Type set to Text. Enter the name of the field under Field label. Under Others access, click Anybody so that the field appears on your membership application form. Click the green Save all changes button at the top of the screen. 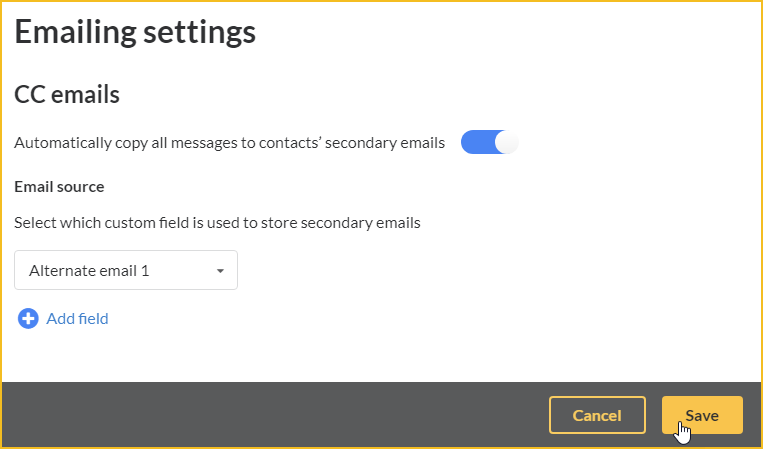 You can create up to 3 secondary email address fields. 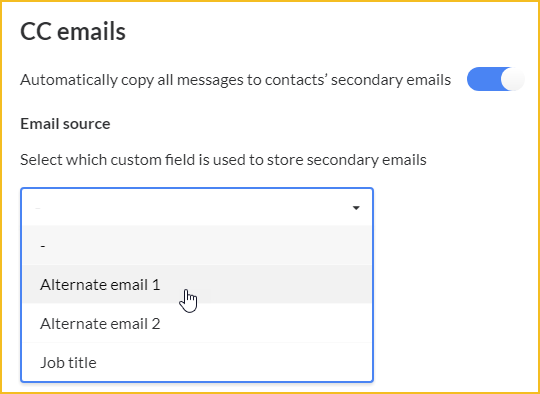 With one or more custom fields set up to store secondary or alternate email addresses, you can enable the automatic copying of emails to 3 of these addresses. Copies of all automatic emails and manual email blasts will be sent to each of the secondary email addresses you enable. Hover over the Emails menu and click the Settings option. 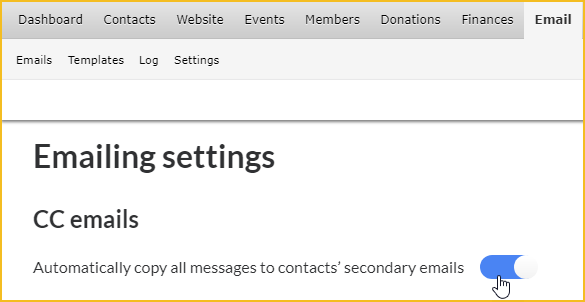 On the screen that appears, make sure the option to Automatically copy all messages to contacts’ secondary emails is enabled. Click the field under Email source to select a custom field used to store secondary email addresses. Only text fields will be displayed. 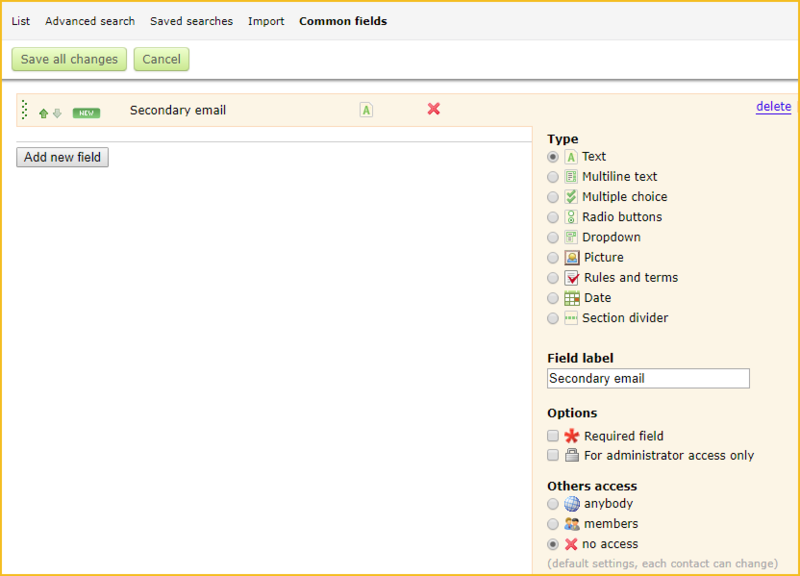 To select an additional alternate email field, click Add field. Click the Save button at the top right corner of the screen. Within the email log, a message will be marked as delivered if it reaches as least one of the recipient's email addresses. Similarly, a message will be marked as opened if the recipient opens the message using any of their email addresses. On the Links tracking tab, the number of clicks per link will include clicks from any and all messages, whether sent to primary or secondary addresses. Secondary addresses will not be listed on the Failures or Delivered tabs. Сlicking the Unsubscribe link within an email will unsubscribe the recipient for all email addresses associated with their account.